The 10 Best Neighborhood Bars in North Dakota! A neighborhood bar is a fun place to get a cold drink after a long day of work, while surrounded by other friendly locals. From cozy pubs to down-home taverns, head to one of the 10 best neighborhood bars in North Dakota for a great night. Kelly’s Bar is a small pub popular among the people of Grand Forks and the surrounding area. It is a local favorite no-hassle neighborhood bar, as demonstrated by their slogan as “Grand Fork’s best upscale dive bar.” For entertainment, there are casino-type games, pools, and darts. They offer a huge selection of drinks, as well as a food menu with everything from pizza to burgers. Located in the tiny town of Tioga, this bar may be a dive bar, but it also has delicious drinks, cold brews, and friendly Midwestern hospitality. It is a favorite gathering place for locals at the end of the day, as well as tourists just passing through town. You’re not going to want to miss Tioga’s Skol Bar! Another of North Dakota’s small town bars, the town of Hampden has less than 50 people and only one bar in town, the Hampden Bar. This small bar has a huge selection of beers and drinks, as well as a full menu with specials. The Hampden Bar may be out of the way for most North Dakotans, but it is certainly worth a visit! The First & Last Chance Bar in Lisbon has great service, mouthwatering food, and cold drinks. It is the kind of bar where everyone knows everyone, but outsiders are quickly welcomed into the community. Join the bar for pool or darts tournaments or just watching sports while sipping a cold beer. This is more than a bar—it is a community gathering place! Johnny’s Lounge is any but “just another bar,” it is a friendly and welcoming environment where the employees treat every customer like family. The bar has sports games playing on the televisions, video games, billiards, video casino games, as well as in-person card games. The bar serves a wide variety of beers and drinks, and they offer delicious American cuisine on the menu. See you at Johnny’s! Since 1979, Rick’s Bar has been one of the most fun bars in Fargo! Not only do they have great drinks and drink specials, but the bar also features live music, a large gaming area, and live music. They serve up a full menu that has favorites like sandwiches, burgers, chicken baskets, pizzas, and plenty of appetizers like French fries and crinkle fries, onion rings, jalapeno poppers, cheese balls, mozzarella cheese sticks, popcorn chicken, potato chips, pretzels, and much more. Bar flies at Mandan’s Lonesome Dove are never lonely when surrounded by other locals filling in the bar! The Lonesome Dove is known for their Midwestern hospitality and cold, refreshing drinks. The prices for drinks and food are reasonable and affordable, making this an ideal bar to wind down at after a long day! Quaint Ben’s Tavern is calming little pub where one can sit outside, have a cold drink, and watch Minot pass by. The charming little building has a blue and orange colored exterior, as well as a welcoming and warm interior. The regulars and bar staff welcome all newcomers like they’re family, making this bar a great place to relax and have a drink! This bar has a fun, invigorating dive bar atmosphere that makes it a popular bar in West Fargo. Town Hall Bar has something for everyone, from pool to darts to the sports games on TV or even just the delightful conversations with other locals. The bar has a huge selection of drinks as well as a food menu with unbeatable options. 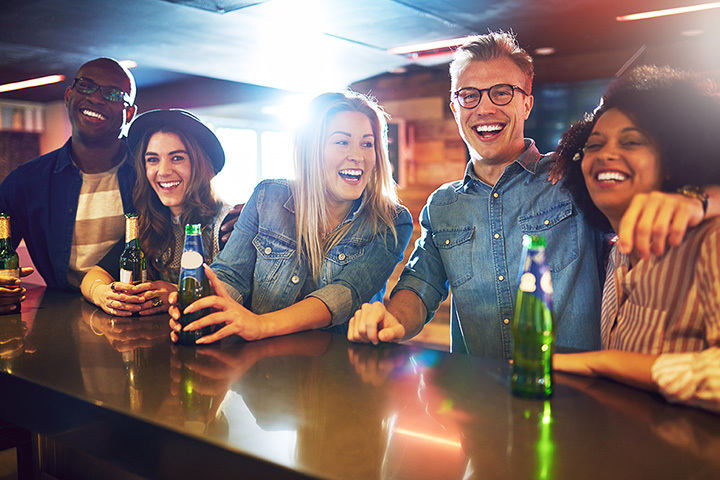 You’ll always have a good time at West Fargo’s Town Hall Bar! With 30 beers on tap as well as liquors, Bismarck’s Stadium Sports Bar certainly has something to quench your thirst! The food menu also has many delicious selections including sandwiches, wraps, handcrafted burgers, 14-inch pizzas, soup, salad, and starters. View more North Dakota Bars and Saloons.